After a long discussion in the kitchen with my (Maltese!) boyfriend, I have to accept that my recipe is not a traditional Maltese timpana – but it tastes just as good, even my man agreed with that! Timpana is a Mediterranean dish which is very popular in Malta and also in Italy. It’s penne or macaroni pasta mixed with Bolognese sauce baked in a pastry shell – basically a pasta pie. My version, however, left out the meat sauce. I cooked a concentrated red sauce with fresh tomatoes and lots of basil instead and sautéed zucchini and aubergine slices until golden and juicy. 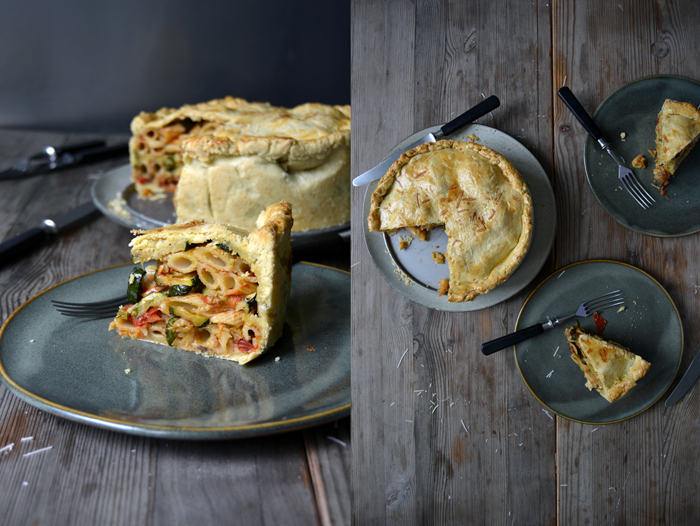 So, here’s the blatant difference, I piled the tomato basil pasta with layers of the sliced vegetables and parmesan in a buttery pastry shell, which, to me, justifies calling this dish Timpana. But sometimes opinions about food differ, especially when it comes to tradition recipes. Obviously I ate my first Timpana in Malta, bought from one of the tiny bakeries you find at almost ever street corner in the towns and villages. They sell this pasta dish cut into large squares along trays full of buttery Pastizzi and rich ricotta filled Qassata. It’s a street food lunch classic on the island. When I ate a piece of this hearty dish for first time, I didn’t quite understand the concept of wrapping pasta in crisp short crust. But after years of enjoying at least 1 or 2 pasta pies during my stay in the South I got used to this tradition bite by bite. 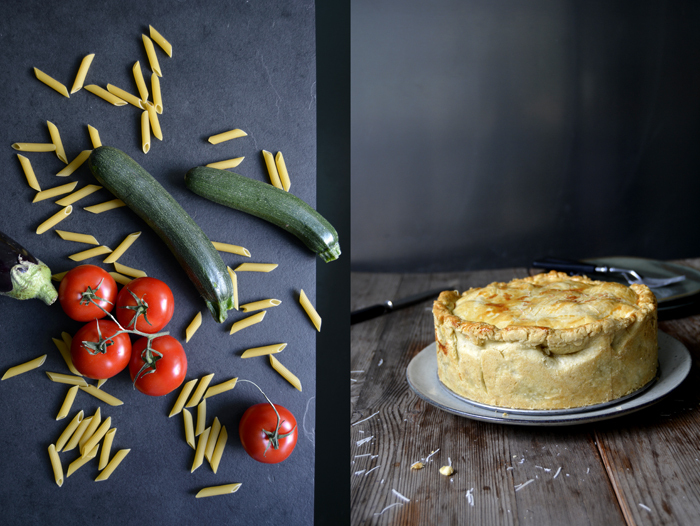 It just makes you feel good, it’s delicious comfort food that combines the best of a pie with lighter comfort of fruity penne. I must admit that I prefer the addition of vegetables, the Bolognese sauce makes it a bit too rich and heavy for my taste. But I won’t argue about that ever again, especially not with a Maltese person! Cook the pasta in salted water until al dente, they should have bite. Let the penne cool. On a chopping board, rub and press the chopped garlic under the blade of a large knife with 1/4 teaspoon of salt until you have a smooth paste. Heat a splash of olive oil in a large pan, add the garlic paste, chopped tomatoes, tomato paste, vinegar, salt and pepper and cook on medium-high heat for about 10 minutes until thick. Stir in the basil and season to taste, make sure that the basil comes through quite strong. Let the sauce cool completely before you mix it with the cooked pasta. In a heavy pan, heat a splash of olive oil and sauté the sliced zucchini on medium-high heat for 1-2 minutes on each side until golden brown. Cook them in batches, they should be spread out in the pan and not on top of each other. Season with salt and pepper and set them aside to cool. Heat a generous splash of olive oil and sauté the sliced aubergine in the same pan. They will need a little more oil (you’ll have to add some in between batches) and they will also need to cook a bit longer, they should be golden brown, soft and juicy. Season to taste and set them aside to cool. Combine the flour with the salt. Cut the butter into the flour with a knife until there are just little pieces left. Continue with your fingers and quickly rub the butter into the flour. Add the eggs and water and continue mixing with the hooks of your mixer until you have a crumbly mixture. Form 2 discs, dividing them roughly 2:1, wrap in cling film and put in the freezer for 10 minutes. Set the oven to 200°C / 390°F (top/ bottom heat). Whisk the egg yolk, milk and salt for the glaze. 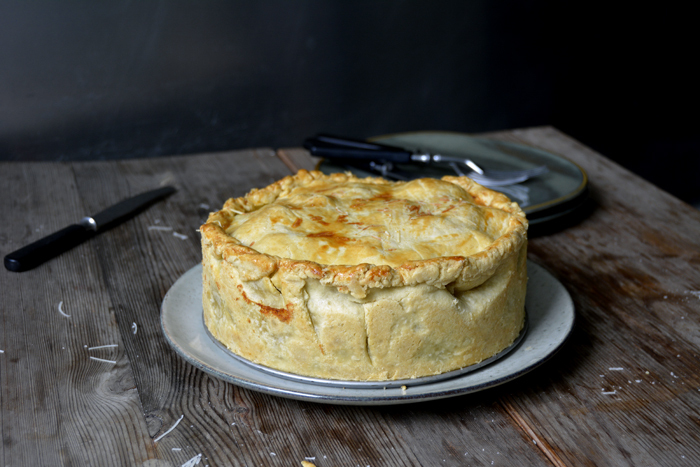 Take the dough out of the freezer and roll out both discs between cling film, the bigger piece (about 32cm / 12 1/2″) for the bottom and the smaller one as the lid for the pie. Line the bottom and sides of the spring form pan. 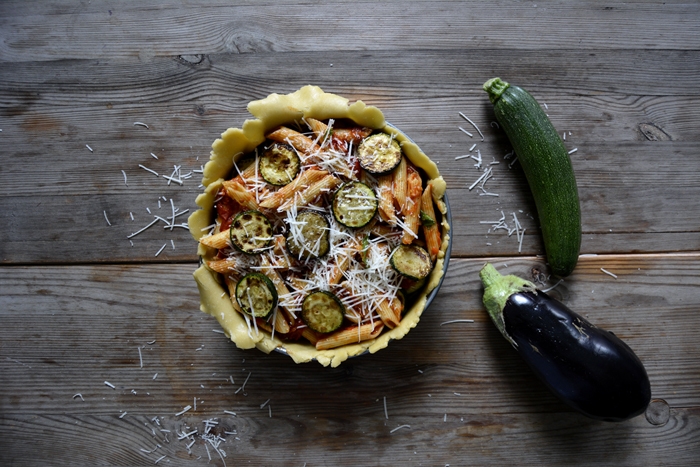 Spread 1/3 of the pasta mixed with the tomato sauce on top of the pastry, sprinkle with 1/3 of the parmesan and cover with a layer of aubergine (let the slices overlap a little). 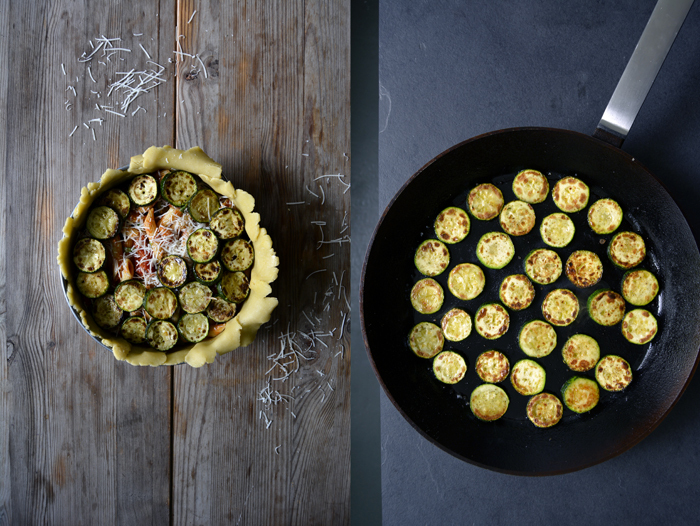 Continue with a second layer of pasta (1/3), sprinkle with parmesan (1/3) and cover with the zucchini. Finish with the remaining pasta, cheese and vegetables (if there are some left). 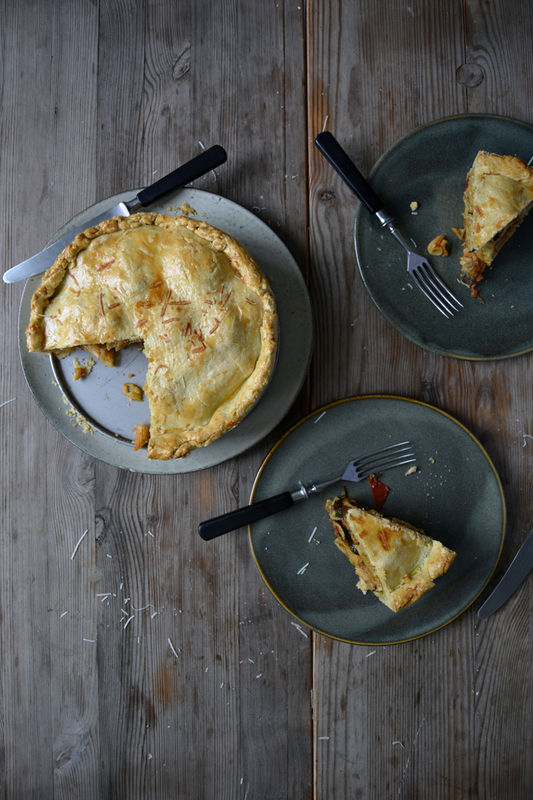 Close with the smaller pastry lid and gently push the rim with your fingers to seal the pie. Brush the top with the egg glaze and sprinkle with 1 teaspoon of the cheese. Bake the pie for 15 minutes before you turn the heat down to 175°C / 350°F and bake for another 50 minutes or until the pie is golden and baked through. 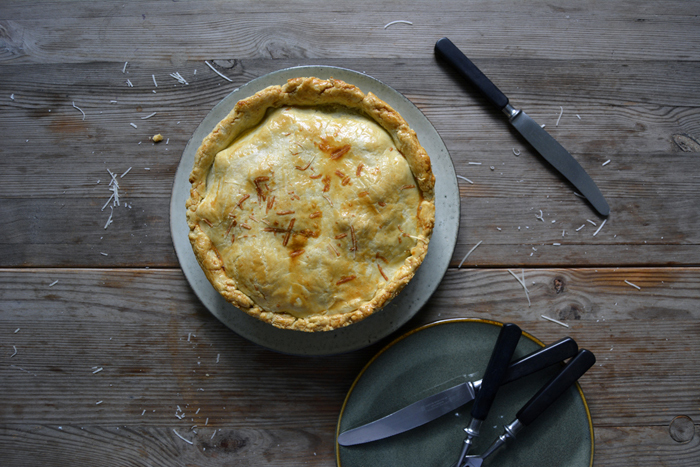 Let the pie cool for at least 15 minutes before you cut it into pieces. Awww. So glad to see a pasta pie! Some used to make fun of my grandma’s amazing cheese pasta pie. I feel vindicated with this recipe. 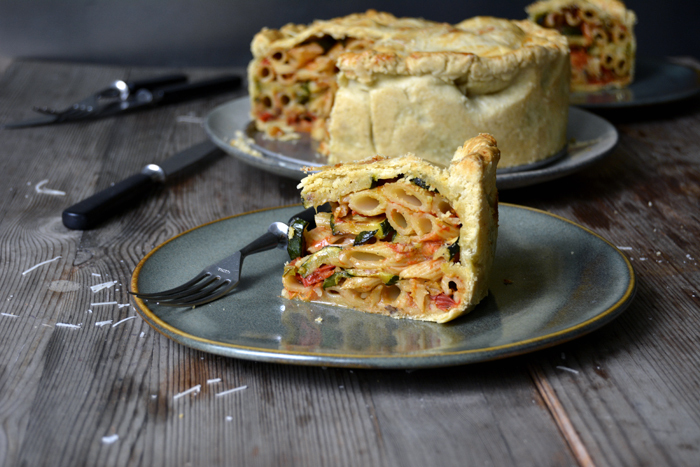 Pasta in pies = Deliciousness. Pinned!